If you worry about your family and their whereabouts especially so if you live in a dangerous neighborhood (and why should you not?) chances are that this little application will turn out to be really handy by helping you track any phone that runs android. 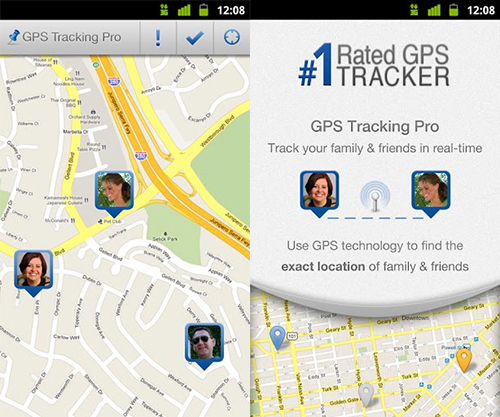 You can use this application to track the whereabouts and exact location of your family members on any android device. The application should also be able to alert you should the people you are concerned about run into some sort of trouble owing to the amazing check-in feature built into this application. GPS Tracking Pro using GPS location to pinpoint the cellphone device and as long as that device is with the person, you have nothing to worry about. The location is pointed out on a mobile application. The problem these days is that everyone is so busy and keeping a constant check on someone (out of worry) you are concerned about can turn out to be a bit of a problem. This application works whether one is at home, work or on the road to somewhere. It doesn’t even matter if you are using an iPhone because even that can work as a GPS tracker for this particular app. All you need to do is download the application, install it and create an account on those devices which you wish to track (which will obviously require permission from the owner of the device). Once you are done with that, you will be able to monitor the location on the ‘parent’ device which usually will be yours. You can use the built-in check-in feature in order to let your friends and family know exactly where you are and that you are perfectly fine. The map will also let you know about nearby hospitals and police stations based on your current location and you can use panic alerts to let your family know that you have run into some trouble and require help. The best part is that this can also be used for tracking and android device itself which means that your phone will never be lost. Once you install it on your device, you can use a computer to locate the phone’s location via a website. If you lose your phone, you can use the website to easily navigate to the current location of your cellphone. This application is available for free on the Google Play Store and should be compatible with any device running 2.1 or higher.